This upcoming Sunday is Father’s Day and thus I want to take a second to thank my dad for all he has done for me in my now 50 years. My very fondest memories of childhood involve various outdoor activities from fishing in the Linton area to hunting rabbits in the Odon area. I didn’t know it then….but dad was grooming me to both love the outdoors and to have a friendship with him that would last forever. A year ago at this time when dad was just a spry 79, I took a video of him on a walk with me down a local creek. I was fishing and he was walking and enjoying just poking around and looking at all the beauty nature has to offer. If you would like to watch this video, entitled “A Walk With Dad”, then click here. 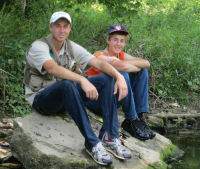 A couple weeks back my two sons; Jonas and Harrison took a break from golf, work and life in general and walked a few miles of a local creek in search of smallmouth, rock bass, etc…I am not sure if either or both of them wanted to come along. I think they love the golf course and playing their sport an awful lot…but they both went and we fished some beautiful water and along the way caught some nice fish….it was a side note to the time we spent together. If you know us you know we are all competitive and it might not be the volleyball court, basketball court or golf course but we still compete while fishing. Some might say this isn’t a good thing, but not me. 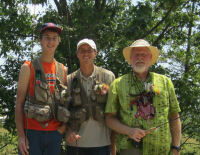 I like competing at all things and trying to out fish the two boys is maybe at the top of my list. Just like my dad there is some method in my madness as I have two real nice kids that I trust to do the right thing when they should. It doesn’t matter if it is away at college or right here in our own backyard…the times we have shared gives me the assurance that for the most part they will do and say the correct thing; funny how that happens to kids that are brought up with a rod or gun in their hand. Seems like others could figure it out…but each day I see kids that are lost and searching for their stream to walk or their field to wander around in. When they were young I could picture them, grown men, with their families around them as they made their way down to a boat dock or stopped to un-load their camper with bikes, fishing poles etc… Now, we are still a ways away from anything like this…but I can see the formula for the photos of my mind are working and it all has to do with our time together in the outdoors. Our fishing trip lasted about 5 hours and we ended up mid-afternoon with both boys sitting on a rock, watching me cast and catch smallmouth bass. As I waded slowly towards the pair, both acting like they were still 4 and 10 years old…I had a proud moment. For the most part these two kids are not messed up. I have watched how they treat others. I watch as they hold doors for the elderly of our church. I call often and they are both spending time with their grandma and grandpa when, like other kids of their generation, they could be at the movies, the mall or who knows where else? And…while they love to give me a hard time, they still know who is boss and who can fish circles around them. I hope that like my relationship with my dad, that we, the three of us, will have many years of great times together whether it be watching a German Shorthair point a rooster, stripping a wooly to a lone trout or simply taking a long winter walk through McCormick’s Creek State Park. Nature and the outdoors is our family tradition; true ours is a little different than that of Hank Williams, but still a great tradition that we can share together and hopefully with many more generations to follow. My hope today is that your dad is still around to enjoy this upcoming Father’s Day with…if that is the case then please plan on visiting him. If not then start your own ‘family tradition’ and get back to nature as we all Enjoy the Great Outdoors.